Definitely trying to clean out my hoard right now, I bought this only a month or two ago but apparently this was canned back in May. 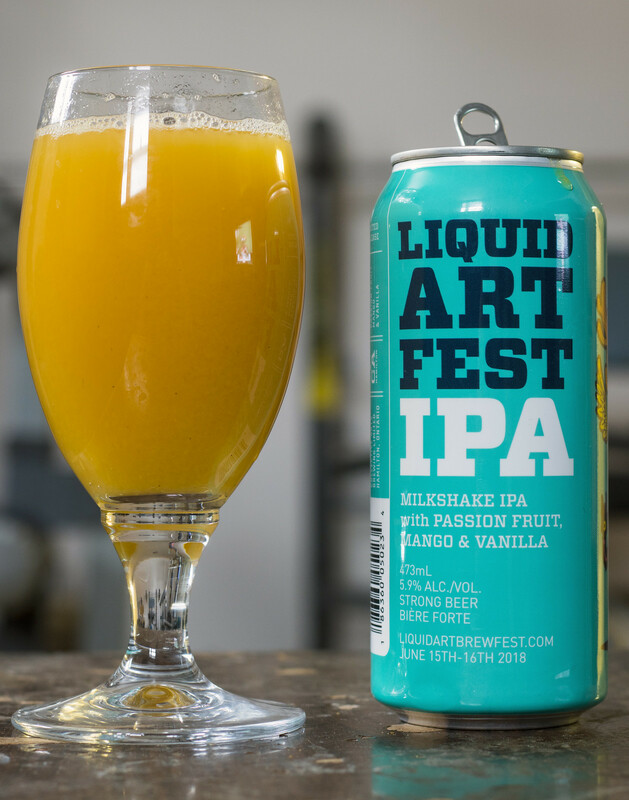 Collective Arts Brewing's Liquid Art Fest IPA is a tropical, full bodied milkshake IPA showcasing vanilla, mango and passion fruit flavours paired with Simcoe and Citra hops. Don’t plan on seeing through this IPA, it’s hazy due to the Vermont ale yeast, lactose and and fruit puree… resulting in an orange hue reminiscent of a tropical milkshake. Appearance: Perfect appearance for a Saturday afternoon - looks like a glass of orange juice, incredibly thick, juicy, orange, and the lightest amount of foam possible.. just like OJ! Aroma: Incredibly sweet and tropical with notes of pineapple, mango and passion fruits. There's a slight hint of vanilla that makes it a bit reminiscent of a creamsicle. Light touch of sourness at the end. Seems more like a kind of tropical fruit juice than a beer so far. Taste: Pineapple pops out at me the very second it hits my lips, it's incredibly sweet, fruity & tropical and it's like a party in my mouth. I'm also getting the same sort of flavours that I got in the aroma - mango and passionfruit, as well as a bit of a lemon.. this is reminding me of a Sunday brunch fruit cup turned into a juice. Light amount of sourness pops up near the end, as well as a hint of creaminess that pairs with a light vanilla presence to give it a light bit of a creamsicle vibe to it. The aroma is definitely more intense than the taste, but this is definitely a great alternative to a Sunday brunch Mimosa. Overall Thoughts: Collective Arts is definitely one of my favourite breweries in the country, their Ransack the Universe is one of my favourite go-to IPAs, plus their artwork keeps things interesting. This beer isn't as creamy as most Milkshake IPAs, but it does have a bit of the typical creamsicle vibe to it.